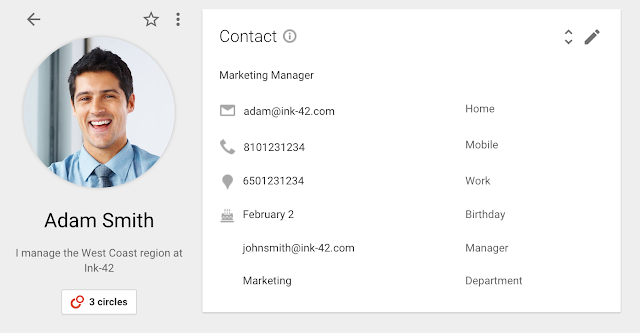 the new Google Contacts preview to consumer users with several time-saving improvements, such as a rebuilt “Find duplicates” feature, automatic updating of contacts with shared Google profile information, as well as a fresh look and feel. Now, we’re pleased to announce that several new improvements have been added at the request of Google Apps users and we’re making it possible for Apps admins to enable the Google Contacts preview for their users from the Admin console. This new Admin console setting is off by default, giving admins full flexibility to enable the new Contacts preview on their own schedule. To enable this feature in the Admin console, click on Apps > Google Apps > Contacts> Advanced settings. 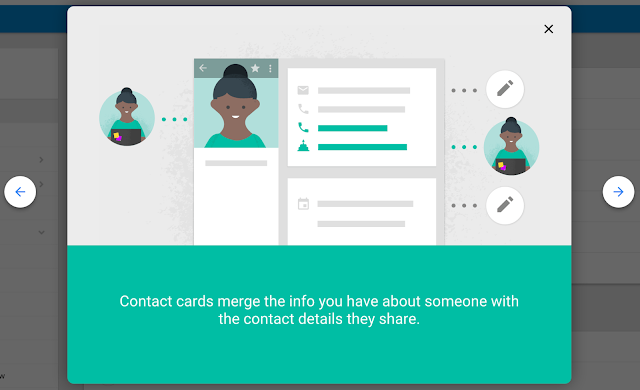 Once enabled, all users will see the new Google Contacts by default and will have the ability to switch back to the old Google Contacts by using the “Leave the Contacts preview” link from the More section of the left-hand navigation menu. After enabling this feature, when users next visit Google Contacts they will see the new UI and a “warm welcome” splash page will guide them through the new features. Easily get rid of duplicates: No one likes having duplicate contacts, but they inevitably crop up. So we’ve rebuilt our “Find duplicates” feature from the ground up to provide a quick and painless way to clean up your duplicates. Improved Domain Directory: The directory is easier to navigate through a more intuitive and faster “infinite” scroll. Automatically Updated Contacts: Users can keep their contacts up to date automatically with shared information from the domain directory, Google+ (if enabled), and more. In addition, Google Contacts also now supports high resolution photographs. 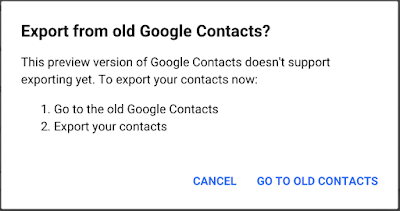 When people try to use these features, they will be prompted with a message that these features are not supported as of yet and presented with a link to go back to the old Google Contacts. 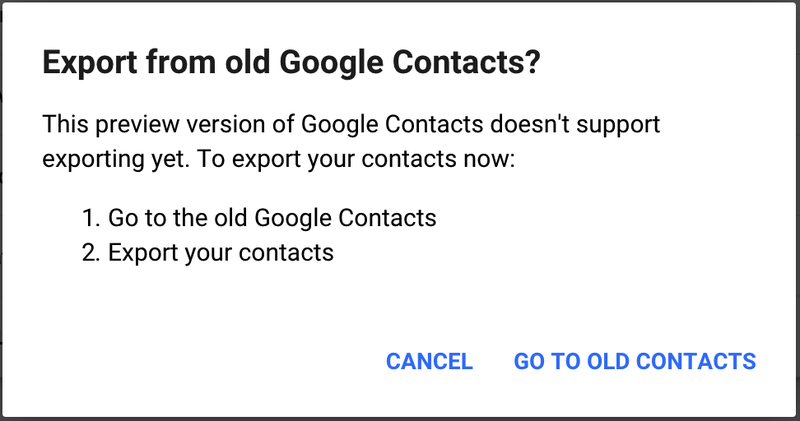 To opt-out and switch back to the old Google Contacts, users can click More > Leave the Contacts preview from the left-hand navigation of the Google Contacts preview. 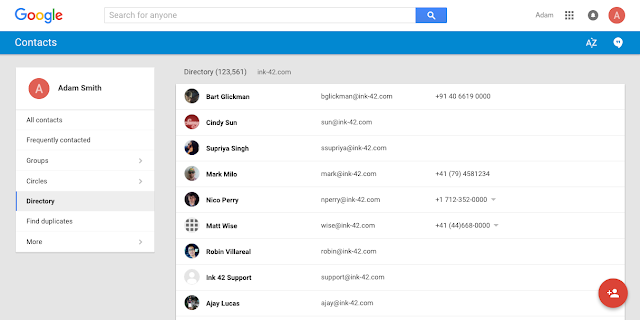 Last year, we launched the new Google Contacts preview to consumer users with several time-saving improvements, such as a rebuilt “Find duplicates” feature, automatic updating of contacts with shared Google profile information, as well as a fresh look and feel. Now, we’re pleased to announce that several new improvements have been added at the request of Google Apps users and we’re making it possible for Apps admins to enable the Google Contacts preview for their users from the Admin console.